A cruise along the Nile, the world's longest river, is one of the quintessential experiences of a trip to Egypt. 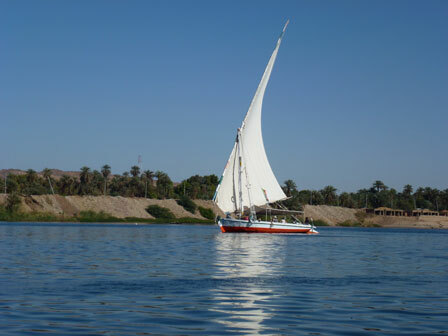 Whether on a felucca sailing boat or a more luxury cruise boat, the trip usually travels from Luxor to Aswan (or in reverse) in southern Egypt. The cruise offers the chance to observe the traditional rural life along the riverbank, relax on one of the world's great rivers and visit two of the best preserved Ptolemaic temples, dating from the 3rd to the 1st centuries BC. The Temple of Horus at Edfu is the second largest in Egypt after Karnak Temple and is in excellent condition due to being covered in sand for centuries. It is notable for having its roof intact, elaborate reliefs, black granite falcon statues and its huge Pylon or Gateway, 79 metres wide and 35 metres high. Further upriver, the twin temple of Kom Ombo is dedicated to the falcon-headed god Horus and the crocodile god Sobek. Organised group tours: Click here to see 11 tours to Nile Valley which may include Nile Cruise.